Wellesley College welcomes former Secretary of State and Class of 1959 alumna Madeleine Korbel Albright back to campus for the 2015 Albright Institute Wintersession. On January 22, 2015, Secretary Albright joins Elizabeth Cousens, U.S. Representative on the UN Economic and Social Council and Alternate Representative to the UN General Assembly, and Dr. Homi Kharas, a Brookings Institution senior fellow and deputy director for the Global Economy and Development program, for a public dialogue on ending poverty and transforming economies through sustainable development. Betty Freyhof Johnson ’44 Professor of Political Science, Wellesley College. What: Albright, Cousens, and Kharas discuss the new post-2015 universal agenda to eradicate extreme poverty by 2030 and deliver on the promise of sustainable development. The talk is free and open to the public. Parking on campus is also free. To request high-resolution photographs and interviews please contact mediarelations@wellesley.edu. 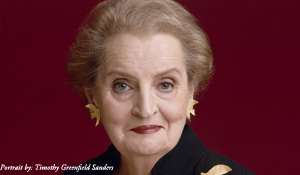 Former Secretary of State Madeleine Albright, a 1959 graduate of Wellesley College, established the Madeleine Korbel Albright Institute for Global Affairs in 2010. The Albright Institute brings a unique interdisciplinary approach to the challenges we face in the world today. Each year, forty Wellesley students are chosen as Albright Fellows and begin a transformative process that takes them from the classroom to internship placements at leading organizations around the world.